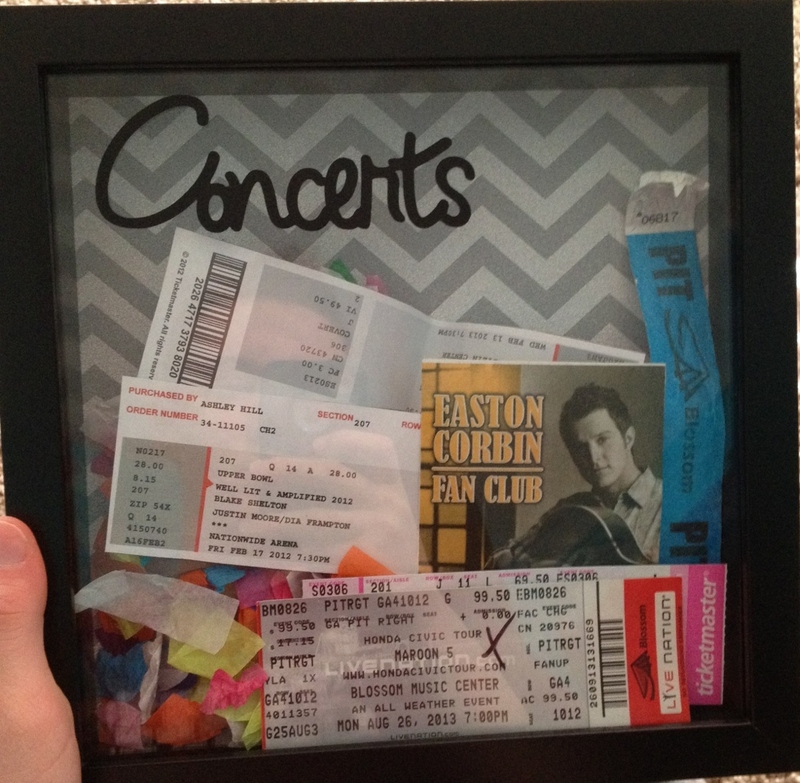 My great-niece, Cassidy has attended quite a few concerts in the past few months, so shen I saw a shadow box on Pinterest for ticket stubs and knew I had to make one for her. I was not quite as handy as the original pin. They put a slot in the top of the shadow box so that you could drop the tickets in. I did not have the tools to do that and I am not sure if that would have been as good for Cass, because I am sure she wanted to showcase her favorite ticket stubs. That would be BLAKE SHELTON! I did not think to take pictures of each step, but this was an easy project. (less than 30 minutes) I got the shadow box from IKEA. (my favorite place) The background is shiny grey chevron scrapbook paper that I purchased at JoAnne’s. 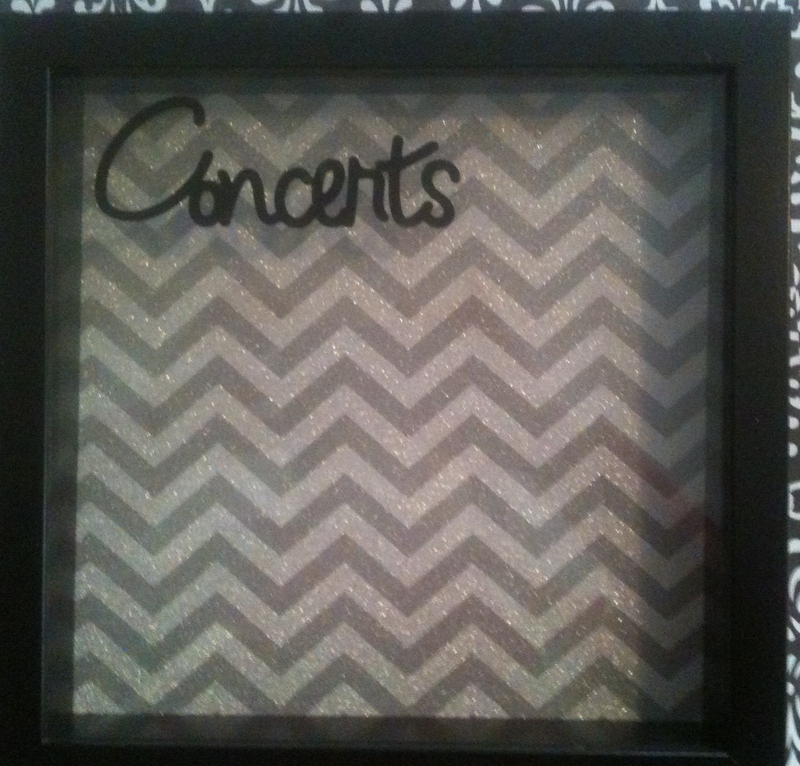 I cut the word “Concerts” from black vinyl with my Cricut. I welded the letters in the “Cricut Craft Room” (the best place ever and it’s FREE). I then just put the vinyl on the outside of the glass. I love the way Cass put her tickets in her box. If you look closely on the right hand side, you will see that she has a PIT Wrist band. She attended a Maroon Five Concert and was in the pit! 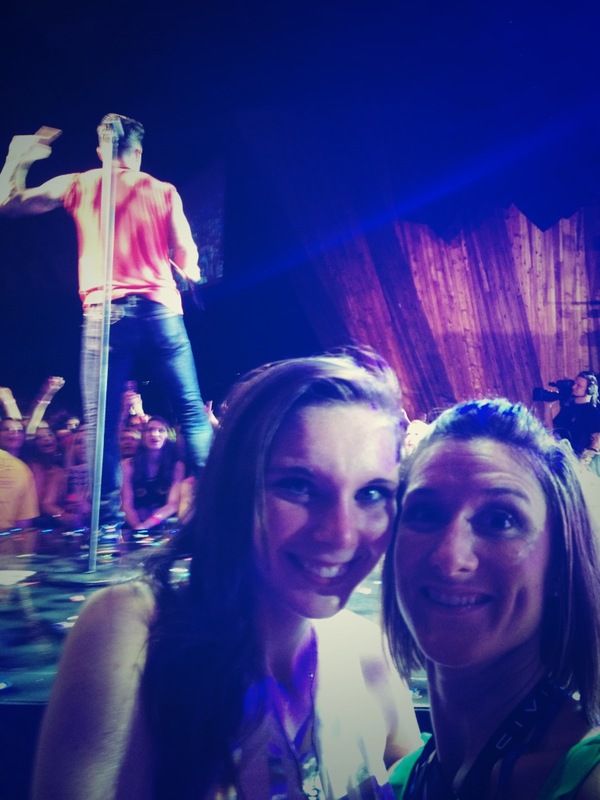 Yes, that is Adam Levine and she was that close…lucky girl!! Love this! Do u know where to find glass shadow boxes which have a small slit in top of the shadow box…saw these on uppercase living which is a home decor company that I love! Let me know…I really want glass shadow boxes!